The Welsh patron saint of friendship and love, Dwynwen fell in love with a young man named Maelon. She was unable to marry him due to her father's refusal and prayed to forget her love for him. 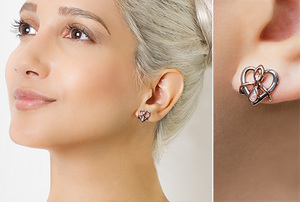 Three wishes were granted to Dwynwen by an Angel who visited her in a dream and are in turn represented in the interlocking rose gold elements in this beautiful collection. The first wish restored her love, the second wish requested the hopes and dreams of true lovers to be met and the third wish was to devote the rest of her life in thanks for all she had been granted. The Angel also gave Dwynwen a potion to forget past hurt, symbolised here by the shimmering opal at the centre of each beautifully handcrafted piece. 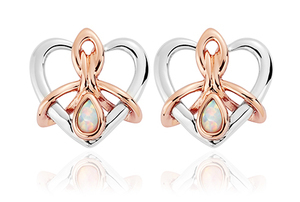 The beautiful silver and rose goldÃ‚Â DwynwenÃ‚Â Opal stud earrings are 11mm wide and each is set with a shimmering opal. This unique jewellery can be treasured forever and worn no matter what the occasion. Containing rare Welsh gold, the gold of Royalty for over 100 years, theÃ‚Â Dwynwen Opal stud earrings have matching items available in this collection.